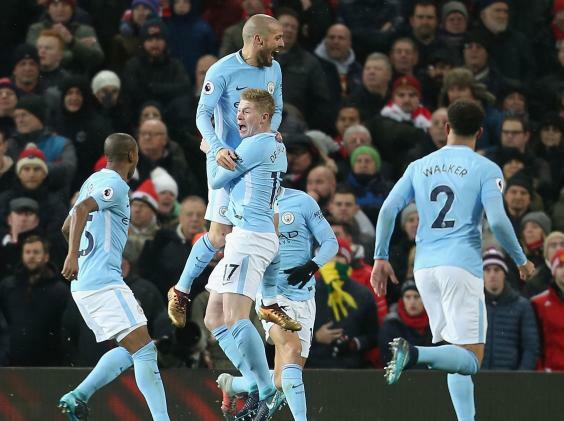 Manchester City won a crucial derby at Old Trafford to give themselves a mountainous 11-point advantage at the top of the Premier League. David Silva handed the visitors the lead but United drew level at the break through Marcus Rashford. However, Nicolas Otamendi made up for a mistake in the build-up to the equaliser by pouncing to fire home the winner, and strike a crucial blow in the title race. Here are five things we learned from the derby. When is it appropriate to stop caveating our assessment of this City team with ‘It’s still early days?’ Because it is December and they have drawn only one game, beating every other team in their way. It is not just that they have amassed 46 points; they have demolished some opponents, found spirited late winners against others, and on Sunday they were deserving winners against their closest challengers and biggest rivals away from home. The question now seems not whether they will win the league but exactly how. Will they surpass Chelsea’s 95 points under Mourinho in 2004/05? Could they be the New Invincibles? What we can be sure of is that their style of football will remain wonderful to watch, and it is perhaps the best ever seen on these shores. Forget the other records – that might satisfy Guardiola most of all. This was an afternoon for Romelu Lukaku to forget. He failed to clear in the lead up to both of City’s goals – the second a particularly messy swipe with his right foot – suggesting that he is not the reliable defensive barrier Didier Drogba once was for Mourinho at set pieces. More worryingly for United should be his lack of productivity in attack. He had little to feed on but when he did get on the ball the Belgian struggled to keep it or use it productively. His best chance came with less than 10 minutes to go when Ederson saved astonishingly with his face. Having scored 16 goals in his first 13 matches, he has only two in the 14 since. There are plenty of players shining under Pep Guardiola right now and none more so that his midfield maestro David Silva. At 31 the midfielder seems to be have found an even higher level: he has been involved in more open-play moves which end in scoring chances than any player in the Premier League this season. At Old Trafford he poached one goal and had a hand in the second, but it was his nerveless temperament on the ball which stood out, even playing some of the second half as a kind of keep-ball nuisance in attack who United couldn’t pickpocket. Guardiola was brought to the Etihad to win trophies and play entertaining football, and he is on course to tick both boxes in the Premier League. But the trophy that will define his tenure is the Champions League – the missing jewel to complete this lavish new era’s set. 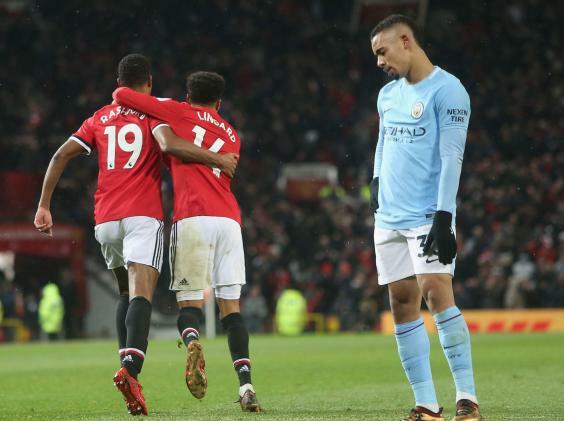 United’s equaliser at Old Trafford revealed a familiar frailty that will be exploited by the best teams in Europe when it comes to the decisive moments later in the season, with Nicolas Otamendi inexplicably misreading a routine cross. Guardiola must find a cure for what seems to be their only ailment if they are to step up from English conquerors to kings of Europe. Sir Alex Ferguson often deployed a player in midfield who would display an endless work ethic most useful in those transitional moments when defence suddenly becomes attack – Ji Sung Park was particularly effective – and in Jesse Lingard, Mourinho has a similar type of player. After a steady period of possession early in the second half, the midfielder made a typically inventive run across the lines to collect an Ashley Young pass and in a flash United were 40 yards further up the pitch. It is that energy and intelligence which has made him a compulsory name on the teamsheet in recent times and he is enjoying a well-earned run in the team.